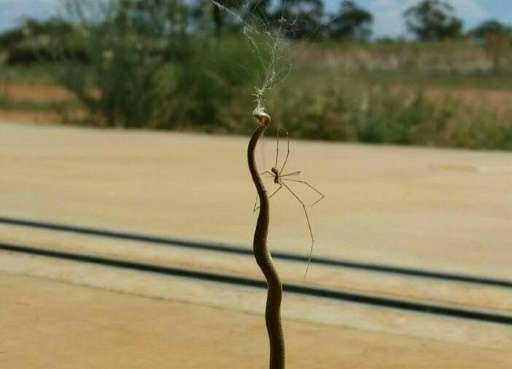 A plucky little spider has once again proved that size doesn't matter by taking on—and beating—a much larger venomous snake, in a very Australian telling of the story of David and Goliath. 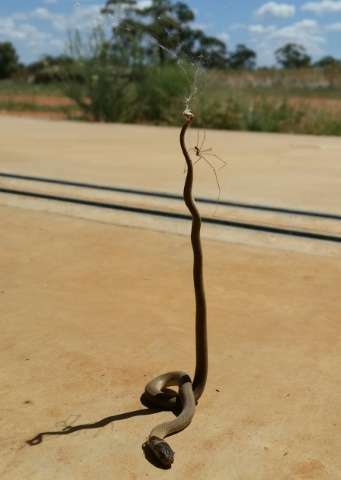 Wildlife experts said it was possible the snake and the spider had duked it out—to the death—but it was impossible to know for sure. Daddy long legs are NOT spiders, but YES they are Arachnids. This really is quite poor from a science site to make that mistake. Pholcus phalangioides, common name Daddy- long legs is indeed a spider. "This is the only spider species described by the Swiss entomologist Johann Kaspar F�Ľssli who first recorded it for science in 1775. Confusion often arises over its common name, because "daddy long-legs" is also applied to two other distantly related arthropods: firstly another arachnid from order Opiliones otherwise known as the harvestman, and an insect less ambiguously called the crane fly." The daddy long leg 'spiders' that live around here don't even bite - don't even have fangs. Nor are they poisonous. Seems a lot of different critters are called by the same name! If it has two body segments and eight jointed legs and no antennae, it's a spider. Opiliones only have one body segment. I stand corrected. IT seems there are THREE creatures known as "Daddy-long-legs", but only one is a true spider.. Thank you Vievet and BSD.